Left to right back: Scott Saxon, Blake Strawhorn, Nick Edwards, Parker Lilly, Zac Berry, Sean Griffith, Elijah Batt, Caleb Busbee, Bailey Goldman, Seth Daniel, Caleb Kemp, Sanford Satcher. 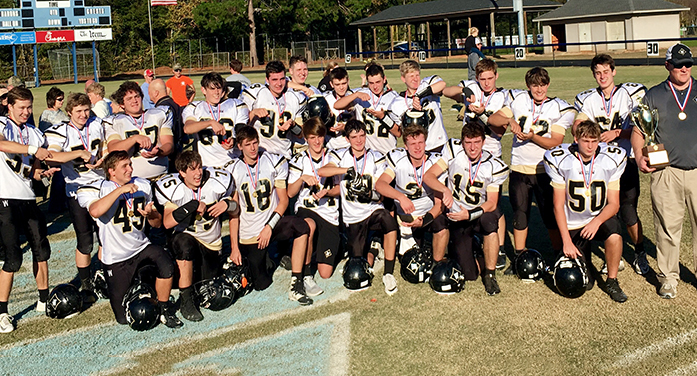 Last Saturday was a rewarding day for the Wardlaw Academy Patriots as they won a hard fought football game over the Holly Hill Academy Raiders 30-22 to claim the SCISA 8-Man Division One State Championship and finish the season at 11-3. The Patriots took advantage of a 37 yard punt return and an interception by Hunter Sherrill in the second quarter to setup two Patriot touchdowns. Sherrill’s 47 yard punt return to the Raider 15 yard line set the Patriots first score up. Two plays later Self Daniels scored from five yards out to put the Patriots up 6-0. That score came at the 11:05 mark of the second quarter. Moments later Sherrill set the Patriots up for a second touchdown with an interception and a return of seven yards to set the Patriots up at the their 44 yard line. On the fourth play from scrimmage, quarterback Brit Gossett broke away for a 44 yard run to paydirt and followed that with a two point conversion run to put the Patriots up 14-0. Holly Hill fought back with an eight play 67 yard drive to cut the Patriot lead to 14-6. The big play in the drive was a 33 yard completion from quarterback Nick Strickland to Evan Boyd to set the Raiders up at the Patriot 22 yard line. Four plays later John Brown scored from four yards out. Holly Hill opened the second half with an eight play 51 yard drive to tie the score up at 14-14. Brown carried the final 13 yards for the score. Strickland added the two point conversion run. Wardlaw scored their third touchdown at the :07 mark of the third quarter. Will Padgett and Gossett with two ten yard runs had gotten the Patriots to the thirteen yard line of Holly Hill. The touchdown came on a pass from Gossett to Mason Burgess. Daniels followed with the two point conversion run to put the Patriots up 22-14. Holly Hill answered that with a scoring drive of 53 yards on six plays. Strickland scored from 1 yard out followed by the two point conversion pass to Dylan Hill to tie the score at 22-22 with 10:11 left in the game. The Patriots came back with an eight play 56 yard drive to score the winning touchdown. Will Padgett, who had been the workhorse all night in the running game, scored from 4 yards out followed by Gossett’s two point conversion run to put the Patriots up 30-22 with 6:24 left in the game. The Raiders final drive was stopped on the Patriots 16 yard line after nine plays. The Patriot defense stepped up strong to preserve the victory. Padgett , in the victory, rushed the ball 30 times for 141 yards. At one point in the first half he carried the ball 12 straight times. Gossett rushed for 73 yards on 12 carries and Self Daniels rushed for 63 yards on 9 carries. The team rushed 51 times for 277 yards. Sherrill had five returns in the game for 114 yards. He had 60 yards on kickoffs, 47 yard punt return and the interception return for 7 yards. The Patriot defense was led by Sherrill with 10 primary tackles and 3 assisted tackles and his interception. Sanford Satcher added 6 primary and 5 assisted tackles. Caleb Kemp recorded 8 primary tackles Scott Saxon added 10 total tackles and Wesley Vega had 6 total tackles. Zack Berry had 2 quarterback sacks.